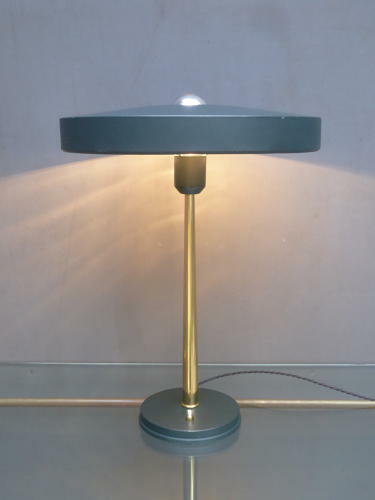 A stunning mid century 'Timor' table lamp by Louis Kalff for Phillips. An exceptional surviving example of an iconic design, in its original painted finish which contrasts beautifully with the gilt brass upright & switch detailing. Designed by the brilliant Dutch architect & designer Loius Kalff (1897 - 1976) who joined forces with Phillips in the 1920's & was tasked with modernising the companies image. Minimum wear commensurate with age, excellent overall. All electrical items should be checked and / or installed by an electrician prior to use.